There are many dishes that one can associate with some special memories. Some can be associated with childhood - food prepared by mom. It can make you nostalgic and flood your mind with sweet anecdotes. Some dishes can be related to events - a special sweet dish or a cake that was meant for special occasion. And some are linked with a particular place - 'nukad ka chaat wala' (road side vendor) who makes the best Papdi Chat or a particular place known for their mouthwatering kulfi. One such dish for me is this Maakhanya Lassi, maakhanya literally means buttery. I brings back to me the memories of visiting Jodhpur, Rajasthan. There is a snack shop (unfortunately I don't remember the name. I will update this if I remember) which is famous for this Lassi. All day long people throng to this place to enjoy a glass or two of this cold Lassi. In summer it sells like hot cakes! 2-3 years back when I had been to Jodhpur, my FIL had taken us to this shop. One sip of the Lassi and I was in heaven. One will be tempted to buy a second glass, but let me tell you, it is very filling. 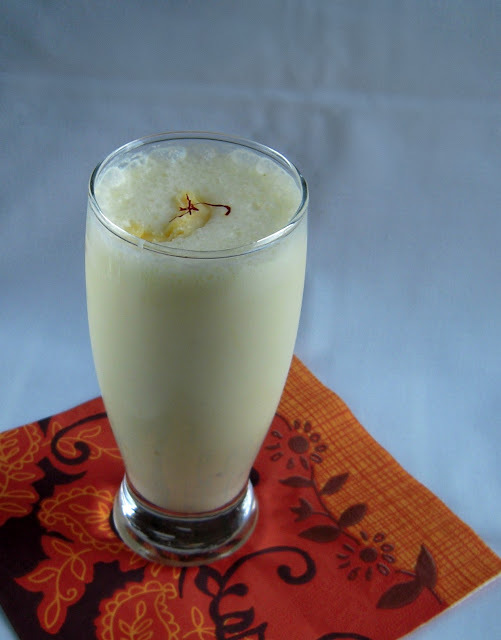 Two glass of this Lassi and you can forget about lunch! 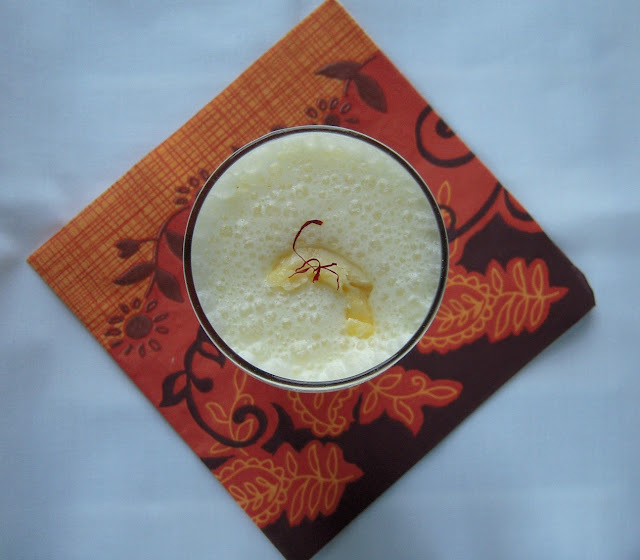 When I had prepared this butter, this Lassi was the first thing I thought of making. I tried to replicate the taste from memory, so, I am not sure if it tastes exactly same, but it is definitely near. 1. Rub the saffron with a few drops of water to bring out the colour. 2. In a blender jar, add yogurt, water, saffron, cardamom, sugar, ice cubes and half of the butter. 3. Blend it for a few seconds. Pour it into a tall glass. Top it with the remaining butter and serve immediately! 1. The butter which is added while blending will be in bits and will float on top. So, you will have a buttery, creamy top layer. You can add more butter to have a thicker creamy layer if you like. 2. Add more water if you like thinner Lassi. It tastes best when served cold. Feel like grabbing that glass and having rite now..irresistible lassi. This sounds delicious! I make a savory lassi (with cumin and pepper and turmeric) for an afternoon pick-me-up but the intent is for it to be low in calories. I'm almost afraid to try this one -it will spoil me forever! I understand Barbara what you mean..;-) Do try this out for some indulgent days..
Nice buttery lassi..ummm beautiful! Love your clicks too.